Still on the run from Tobias, Jennifer and Khalil start to ponder their future together. Meanwhile, Jefferson approaches Henderson about a favor. What are the odds that Lynn would give her little "Come home" monologue in the same train-yard Khalil and Jennifer were hiding in? Or was she giving that speech in every abandoned building in her territory? China Anne McClain is pretty much carrying the show at this point, at least so far as all the scenes involving The Pierce Family go. 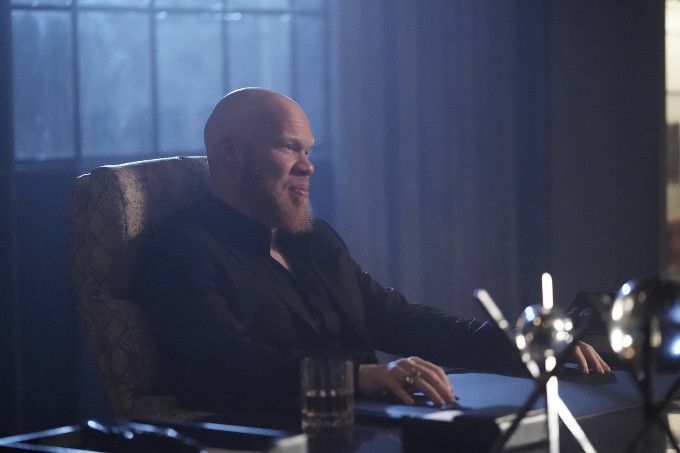 Again, Marvin "Krondon" Jones III is a marvel, capable of playing charming one moment and sadistic the next. Even by the standards of this show, the soundtrack for this episode is top-notch. Near the end of the episode, Tobias discovers that the ASA had four metahumans cryogenically frozen that they dubbed the Masters of Disasters. This is the name of a super-villain group with elemental themed powers which first appeared in Batman and the Outsiders #9 (April 1984). Their membership consisted of water manipulator New Wave, earth manipulator Shakedown, fire manipulator Heatstroke, cold manipulator Coldsnap and wind manipulator Windfall. Gambi is able to track Khalil's phone usage and pinpoints a two mile area he might be hiding in after eliminating all his usual hang-outs and places Tobias controls. Todd Green is an encryption specialist and an expert on the internal workings of algorithms. Jefferson's super-suit has the ability to display holograms through a projector in the gauntlet. Khalil: You remember that time I asked you to be my girl? Jennifer: Yeah. How could I forget? (chuckles) You said that if anything had happened to me, the thought of not being able to ask me out would mess with you. Yeah, I remember. You was all shy and cute. Jennifer: Don't worry! You're still cute now that we cut off those promoter dreads. Khalil: Hey. It's okay. I'll wait. Jefferson: Khalil knows too much to risk Tobias getting his hands on him. Khalil: You mean about Jen having powers? Or you being Black Lightning? Khalil: She didn't tell me. (shrugs) I'm not stupid. I mean, she's electric and you and Thunder came after us. Henderson: I can't believe you're trying to save this kid's life after all he put you through. Jefferson: I know, man. I know. But... I guess I'm just glad that he's.. he's the person I thought he was. Tobias: I told you I'd always have your back. Khalil created an apartment for himself in an abandoned train car. Khalil is a talented artist and drew several sketches of Jennifer. Lynn tells Jefferson about her talk with Khalil's dad in 209 and how he had an apartment somewhere. Khalil gives Jennifer back the necklace he got for her when they were dating. Tobias Whale is an expert on the history of jazz music. Todd Green is a vegan. Todd Green is an encryption specialist. Tobias wants Todd Green to fully hack Proctor's briefcase. It is revealed that Tobias has managed to partly hack the computer inside Proctor's briefcase. He discovered some information, mostly about crooked politicians in Freeland, corrupt agencies of law enforcement, judges and some very interesting real estate purchases made under an alias that does not exist. Tobias bought all the land the ASA was interested in except for Reverend Holt's free clinic. Tobias has no idea why the ASA wanted the land and wants Todd Green to figure that out along with what this has to do with metahumans. Jefferson is able to speak Spanish. Jennifer and Khalil return to the Pierce house. Todd Green comes up with a list of the three places Khalil went to most frequently for Cutter. Todd Green determines that there's some holes in Cutter's resume while researching her. This doesn't make her happy but Tobias praises his initiative. Cutter finds Khalil's train-car apartment. Khalil decides to turn himself in, at Jefferson's prompting. Jefferson tries to make a case for leniency to Henderson. He eventually persuades him to go to the FBI to make a plea bargain and to let Khalil see his mother before he turns himself in. Tobias has Assistant District Attorney Montez in his pocket and arranges to have a blue .450 sent to them after they give him the information on where Khalil is turning himself in to the FBI. Khalil says that none of what happened to him is Jennifer's fault and he didn't mean what he said about her making him go to the march in 103 ruining his life. He says that Jennifer is the best thing that happened to him. Cutter captures Khalil from the FBI convory. Tobias rips out Khalil's spine, leaving him in the middle of the road in front of Rev. Holt's church. Todd Green hacks the computer and gains access to something called Project M.O.D. Project M.O.D. gives Tobias access to the information on the Pod kids. Todd Green also discovers that the free clinic was the first place the ASA bought when they came to Freeland and started handing out the Green Light vaccine. Reverend Holt took the clinic over after the vaccine project was abandoned. M.O.D. stands for Masters of Disaster - four super metahumans in cryogenic suspension contained with the old ASA facility. We don't see the fight between Cutter and the various FBI agents. Again, it's unbelievable that Jennifer and Khalil are able to evade all the people they do who are trained hunters. Telekinetic bullet-dodging powers aside, it still beggars belief that Cutter is able to taken on a dozen FBI agents and police officers by herself and kill them all. By all rights, this should have been the mid-season finale. The cliffhanger ending is great and hints at big things coming. Unfortunately, the story still suffers from making the villains unbelievably invincible and the heroes incredibly incompetent, except when the story dictates otherwise. Still, China Anne McClain and Marvin "Krondon" Jones III manage to carry their scenes through sheer charisma.